Lots of people experience some sort of travel anxiety. Have you ever noticed how your partner gets extra ‘stressed’ when you have to drive to the airport? Or how your friend shuts their eyes tightly and prays when the plane experiences unexpected turbulence? That’s travel anxiety—and it’s completely normal. A lot of us feel unsettled when we do unfamiliar things in new places. And while taking a holiday is great, travelling is a breeding ground for long-forgotten fears, family conflicts, and bad habits to come into play. These things don’t have to ruin your holiday though. If you manage them well, they can help you have an even richer and more rewarding experience. From the planning stages to travel itself, here are eight ways you can reduce travel anxiety and (hopefully) a lot of the drama that goes with it. A lot of travel anxiety comes from uncertainty. Some of this can occur when you are deciding when and where you will travel to—especially if a friend, partner or your family is throwing ten different options at you! In this situation your priority is solidifying where you will go and when. Block out all the voices (quite literally if needed) and make a list of the places you want or need to go. Place the pros of cons of each destination next to them—consider who you will see, how expensive it will be, and how long it takes it travel to the destination. This will help you to narrow down the top choices for everyone, and you can discuss the best option from there. Once you’ve decided on a destination, commit to it and set a timeframe for your trip. This helps you to avoid any uncertainty about the future and keeps you and your loved ones accountable to keep it. A budget is boring, but it will keep you from stressing about unnecessary purchases or the bills sitting on the table when you arrive home. Factor in the price of travel, accommodation, food, shopping and unexpected expenses. Even with a budget, some people never seem to stop worrying about cost, so make a conscious decision to enjoy your holiday. Whenever the compulsion to worry or complain about the price of something comes up, remember your budget and see if what you’re spending fits into it. Sticking to your budget gives you permission to enjoy your travels without constantly worrying if you will have enough. Are there parts of your trip that concern you? Are you on a tight budget, concerned about jet lag, or are you stressed about events going on at home? Tell your travel partners. 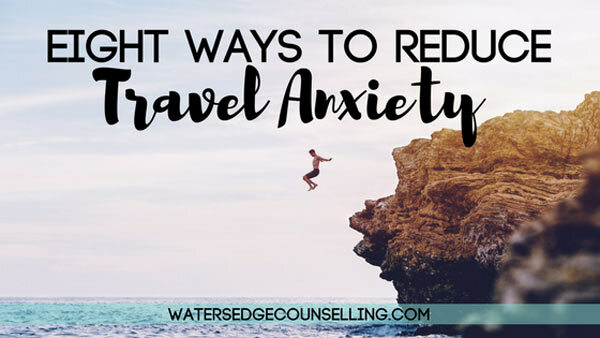 We often feel like we have to hide our anxiety so our travel partners can have a better holiday, but by doing this we often reflect our stress onto them. They are left feeling powerless to help you, and this can create conflict. If you have concerns, tell your travel partners. Be it a friend, your spouse or even the kids—let them know that you are feeling stressed due to this, and you may need some extra support or understanding in particular parts of your trip. If you sense the anxiety rising up during your trip, let them know you are struggling. From here you can take steps to care for yourself while your friends continue to enjoy their trip. Some people thrive off spontaneity. They love the idea of arriving at a destination, and figuring out their accommodation and transport on the spot. If that’s not you, give yourself permission to pre-book everything. From flights, to hotels, rental cars, tours, even some meals—if pre-booking alleviates your stress when you arrive, do it. And if the thought of pre-booking still feels like too much, speak to a travel agent. Pre-booking things also gives you the opportunity to compare prices and research the area you are visiting before you arrive. This takes into account the safety of the area, how close you are to attractions, and the time required for different activities. This level of planning isn’t everyone’s cup of tea, and fluidity and spontaneity on a holiday is a good thing. However, if you know these details will cause you more stress than enjoyment when the plane touches down, book ahead. It’s better for everyone. We all have different priorities when we travel. Some people are in it for the adventure, some for the relationships they want to cultivate, and others for the sights and sounds of a new place. Once you identify your priorities, you can figure out how to make them happen in the least stressful way possible. For instance, if connecting with family is a priority—but you also know they cause you stress and you can only see them in increments—then you can break up your interaction with them by planning social activities. You could also schedule tours and road trips every few days to give yourself space. If relaxing is a priority, then you may prefer lounging by the hotel pool to seeing the hidden treasures of a foreign city. And if you and your travel partners have different priorities, then give yourself permission to alternate between activities or do things on your own. Anticipating how you will feel when you travel isn’t about catastrophising a situation (“The plane is definitely going to crash!” comes to mind), it’s about remedying a crisis before it may happen. If you know turbulence causes you anxiety, or you become claustrophobic on long trips, bring some earphones, a sleep mask and speak to your chemist about over-the-counter medication. If you’re afraid of entering a new culture, speak to someone who has travelled to the area before and research the customs, norms and values on the Internet. If the concept of running through airports between layovers is anxiety-provoking, familiarise yourself with the layout of the airport before you arrive, and tell a flight attendant you need to make a connecting flight. Are you travelling with other people? Set your boundaries early on. This may require separate bedrooms, alone time or different itineraries. Boundaries are a key to survival when you travel with others. The entire experience is a melting pot for heightened emotions and expectations, and due to this irritation and frustration can occur more frequently. Anticipate that this will happen, and make allowances for it. If you partner becomes moody when they are hungry, schedule in your meal times and make them non-negotiable. If you are not a morning person, allow your friends to explore while you stay in bed, and join them later on. If a friend is a chronic planner or wants to control everything, determine what you will and won’t do ahead of time and tell them when they are going too far. Boundaries aren’t just required between travel partners, they are also required when we visit or meet people in our travels. If you know your relatives will try to ‘fix’ you or plan your entire trip, make your schedule clear and don’t give them any leeway to change your plans or your life. Arriving is one thing, but by the time you return home everyone is exhausted. Mentally, emotionally and physically, you will be drained and ready to crash in bed. Make allowances for this by asking someone to pick you up, having transport ready and accessible so you can return home as soon as possible, or even getting take-away food on the way home. Don’t expect yourself for your travel partners to be angels on your return. Give each other grace when you are tired, and make sure everyone can eat, shower and sleep as soon as possible to diffuse any tension. Unpacking can always wait! Does the ideal of travel make you anxious? Would you like to explore strategies that can assist you on an upcoming holiday? Here’s what you need to do: contact Colleen on 0434 337 245 or Duncan on 0434 331 243 for a FREE 10-minute phone consultation on how we can best help you, or press book now to book on our online diary.